This Weatherguard Greenhouse can save you money by allowing you to start your plants from seeds yourself! Don't spend hundreds of dollars at a nursery every spring. 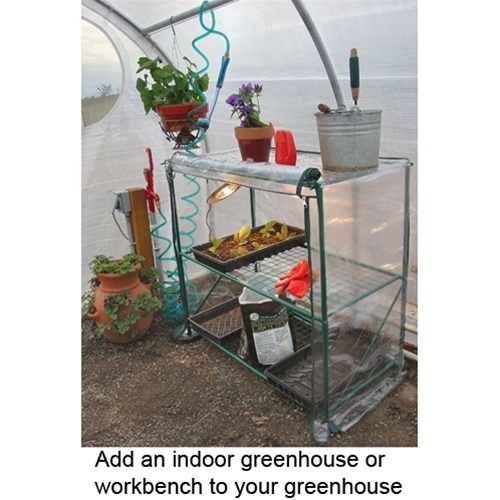 Start your own plants with your own greenhouse. It's ideal for starting flowers, seedling starts & winterizing plants. Features include a triple ridge pole roof system which will safely support your hanging plants. It also has cross sided ventilation and upper zipper screen vents. The exclusive all steel flex frame design is made up of galvanized 1-1/4" O.D. 16 gauge ( .059") steel and 14 gauge (.078") inside slip fitting joints. The cover material is a rugged 3 layer laminated polyethylene which has UV protection and has a 200 gram 12 x 14 crossover weave. The three piece construction consists of a Cover, vented end panel and a door panel with 2 zippered vents. It also comes with cross side ventilation and upper zipper screened vents. Begin by laying out the pressure-treated 2"x4"s on your flat, level site to form a rectangle. Using the nail plates, join each board together at the corners to connect the rectangle. Then, carefully flip the foundation over. Hammer in the second set of nail plates on each corner of the 4'x8' foundation boards to form a rigid rectangle. To complete the foundation, anchor the 6 supplied base plates (4 corners and 2 centers) to the foundation boards using lag screws. Start by lagging a corner base plate, insert a bottom purlin to determine correct spacing to the center base plate, and anchor the center base plate with the purlin in place. Insert the next bottom purlin and anchor the second corner to complete one side. Repeat these steps on the the other side. Working from the foundation up, begin assembling the greenhouse framework. First, install the short straight vertical extension tubes and straight connector fittings over the top shaft of each base plate. CAUTION! The Weatherguard™ Deck & Patio Greenhouse frame design is flexible. Please be aware that overhead parts and/or pipes can come loose and fall during assembly. DO NOT allow children on or around the assembly site when erecting your greenhouse. And ALWAYS pay attention overhead for safety! Using the safety ropes supplied to firmly tie each arch together will hold all fittings and purlins in place. After assembly, safety ropes must be left tied in place for added wind stability. 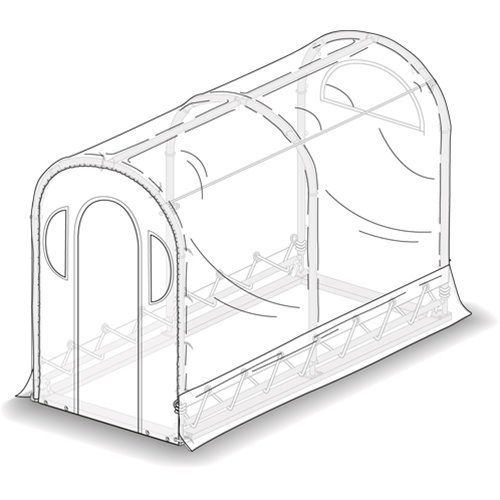 Next, using T-fittings for the front and rear greenhouse ends and cross fittings in the middle, begin forming the arches and inserting the remaining purlins. 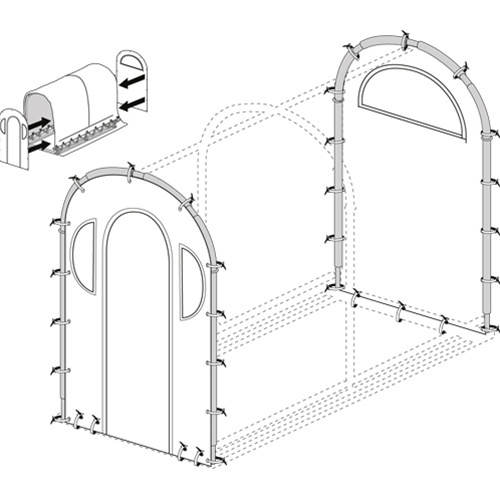 Each arch requires 4 curved pipes with either 3 cross fittings or 3 T-fittings. NOTE: Please take great care when handling the roof skin to prevent scratching or piercing during installation. 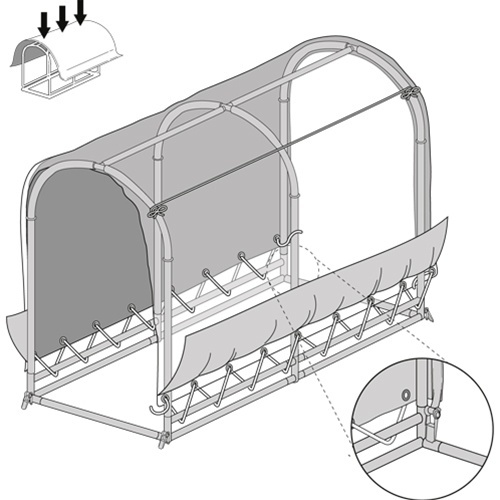 Place a ground tarp under the roof skin during assembly. Do not walk on the material at any time. 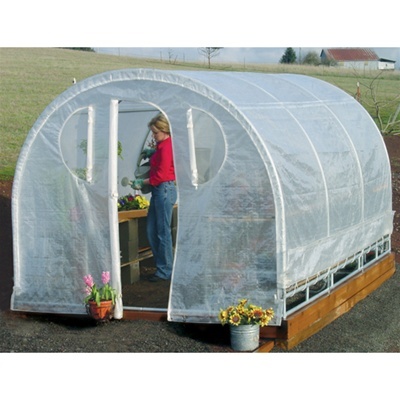 Unfold the roof skin with finished seams facing up and lay it next to the bottom purlin on one side of your greenhouse. Center the roof skin so approximately 4" of material extends beyond both ends of the framework. Using the supplied lacing rope, lace the bottom edge of the roof skin through the reinforced grommets to the bottom purlin. The space between the roof skin and bottom purlin should be between 1/2" to 1". Now you are ready to lay the roof skin over the arch framework. Keeping the roof centered, VERY CAREFULLY lay the roof skin over the frame. Now that the roof skin is over the frame, lace the bottom grommets to the bottom purlins, starting from the middle, as on the first side. CAUTION! LACING THE GROMMETS TOO TIGHTLY CAN DAMAGE THE COVER! Besides providing access to your greenhouse, the door panel can be used to help regulate the interior temperature. Using the supplied zip ties, begin attaching the solid end panel and door panel to the framework, working from the top center of each panel. CAUTION! Overtightening zip ties can damage the panels, as well as causing difficulty opening and closing the door panel. Complete the door and end panels by securing them at the bottom. Insert screws through the grommets at the base of each panel and lag them into your foundation boards. Roof skin flaps on framework ends and along sides help seal your greenhouse, creating a controlled growing environment. Using the four ratchets supplied, install one on each corner base plate. A flat webbing rope extends from all 4 corners of the roof skin. Insert the webbing into the ratchets and slowly begin tightening each corner, alternating between the 4 corners and tightening a little at a time. As you tighten the ratchets, the 4" roof skin flap will fold over the framework ends, helping to secure your powder coated framework together.